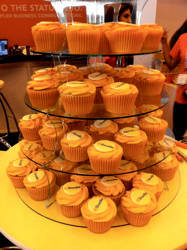 IP Expo It's October and that show has come around again – IP Expo, the successor to Storage Expo. 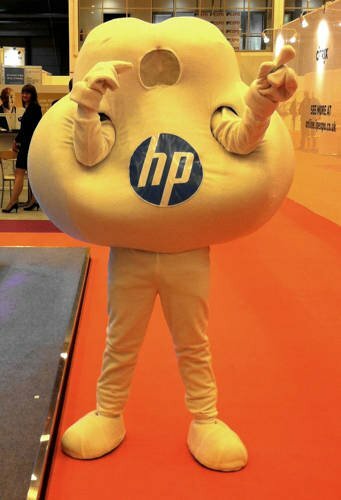 This year, the UK's "premier IT trade show" took place in Earl's Court, and saw a busy floor with lots of stands, lots of lead-hunting stand staff and the usual assortment of attention-grabbing oddities, like a man dressed as an HP Cloud, cupcakes and an angel. There was more than enough news and gossip to go around, but we've sorted through them to bring you the juicy bits. Contrary to previous ideas that Amazon's Glacier cloud archival storage uses disk-based object storage, the latest word is that it is based on LTO6 tape. This comes from a nameless but senior person in the IT industry who "cannot talk about it". El Reg has also heard the same from another source in the general IT industry. This idea of tape being the Glacier store fits in with the longish retrieval time for Amazon Glacier data and the cheap-as-chips cost structure Glacier has. El Reg reckons the Amazon system uses IBM LTO-6 drives and big tape libraries from either IBM (TS3500), Oracle (StreamLine) or SpectraLogic (T-Finity); there being no other big library vendors. CA has moved all its storage assets into a stand-alone business, the Data Management business unit managed by Mike Crest. Chris Ross is its VP world-wide sales and he's been at CA for some three years, coming from Bakbone. There are some 600 people world-wide in the BU. Ross says that the ARCServe product set - Backup, Replication, HA, and Disk-to-Disk - is a single all-in-one data protection product set with single pane-of-glass management. CA has something of the order of 300,000 or more ARCserve customers and there are some 8,000 partners selling the products in Europe with a 2-tier distribution model. will be ready for his children's party gig. The legacy business is selling to small and medium enterprises but the BU is focussing on the enterprise and the cloud, meaning managed service providers. The Data Management BU owns its own product technology and roadmap and has been set up to generate more revenue from CA's storage assets. Ross says that one goal is to gain new customers. You betcha. Andy Monshaw is moving within IBM from running mid-markets to running the Pure Systems business to lead IBM's fight against Oracle's engineered systems. Prior to the mid-market gig he was COO for IBM Japan and before that ran IBM's storage business. He bought XIV into IBM and Diligent. Some say he "fixed" IBM storage and is making it exciting again. From what we hear, it's abundantly clear IBM is getting really serious about converged systems. Coraid has knocked out a 3PAR system at a US hedge fund managing $10bn of investments. The customer bought an EtherDrive array with the ZFS head, 386 OCZ 400GB SSDs, Cisco UCS servers and Arista switches. This hardware stack is used for running tier one VMware and database applications. Coraid's EVP world-wide sales, Carl Wright, said an "all-flash 3PAR array was millions of dollars more expensive." Wright said Coraid had increased revenues 12x in two-and-a-half years, had reached the 1,700-customer mark, and was adding 70-100 new customers a quarter. Fifty per cent of the revenues comes from repeat buying by the installed base, claimed Wright. He said that he thought that the company was more than 12 months away from an IPO, which was the goal. Our guess is that Coraid is not that much mote than twelve months away from its IPO. SpectraLogic VP of worldwide sales, Brian Granger, commented that he was seeing the rate of Fibre Channel over Ethernet (FCoE) adoption increasing. Does this mean that FCoE's latent promise is about to be realised? We might expect an announcement or two from Spectra in the next month is my guess. Overland Storage has a major product out, the SnapScale X2, which is a scale-out NAS (Network-Attached Storage) product using technology acquired through Overland's Maxiscale acquisition – background here. It offers a single global namespace, five nines reliability, high availability, replication and disaster recovery, dead simple installation and operability, and both scale-up (add drives) and scale-out (add nodes) capabilities. European VP Sales at Overland, Andy Walsky, said it had been tested up to 200 nodes, but could go up to 10,000, with a total capacity of 512 petabytes. Adding nodes increases overall performance as well as capacity. A 3-node cluster does more than 400MB/sec and this scales linearly. The operating system is called RAINcloud, RAIN standing for Redundant Array of Internet Nodes, and it provides a distributed filesystem, load balancing, web-based management and the global namespace. Data protection is by 2- or 3-way data redundancy. Overland's other filer product, its SnapServers, can replicate their contents into a SnapScale cluster. Competitors include Scale Computing's R-Series and EMC's Isilon scale-out filers. The table below provides a street pricing comparison.